Copper alloys are widely used in marine applications because of their resistance to corrosion and because they have good machinability. The term machinability refers to the ease with which a metal can be cut (i.e., machined) to achieve a satisfactory finish at a very low cost. Cooper alloys are also known for their thermal and electrical conductivity. Bronze alloys, in particular, are the preferred metal for casting large ship propellers. There are several copper alloys used in marine applications, including brass and lead which, again, possess good machinability. The firm Mecklenburger Metallguss GmbH (MMG) of Germany is considered a world leader in the design and production of ship propellers for large container vessels. In 2006, MMG produced the world's largest ship propeller for the Emma Maersk. Measuring a stunning 1,302 feet (397m) long, the Emma Maersk is one of the longest container ships ever constructed. The metal used to cast the Emma Maersk propeller is an alloy of copper, aluminum, nickel, iron, and manganese. The six-blade, single-piece propeller took one and a half years of development and planning alone. Building a large ship requires a massive amount of engineering work. Even the smallest parts require a lot of time and effort to design and build. The part that requires the most amount of time and thought is the ship's propeller, the piece of equipment that propels the ship forward. The propeller has to endure millions of miles of travel while moving the vessel fast enough to get from port to port on time. The ship propeller has a diameter of 31.5 feet (9.6 meters) and weighs over 130 tons. Because of its massive size, it required two weeks to cool after casting. After that, it took another three weeks of milling before it was ready for delivery and installation. To give you a sense of the massive size of Emma Maersk's ship propeller, while the Emma Maersk propeller ranks number one in the world, Queen Elizabeth 2 ranks five and the Bismark ranks eight. 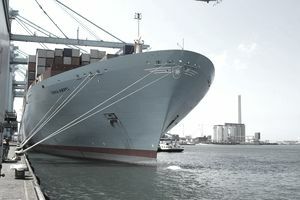 The Emma Maersk is powered by the world's largest single diesel unit. The Wärtsilä-Sulzer 14RTFLEX96-C 109,000 horsepower engine weighs 2,300 tons and burns 3,600 gallons of heavy fuel oil per hour. Due to the massive amount of fuel burned, some of the exhaust gas is returned to the engine to lower the environmental impact and improve efficiency. Some of the gas is also used to power a steam generator to create electricity and heat, thus making it even more environmentally-sound given its size. The ship is painted with a special silicon-based paint. Like more commonly used biocides, it keeps barnacles from attaching to the hull. Unlike the biocides, however, it is not toxic to ocean life. The paint not only protects the sea but also lowers drag and increases efficiency. The paint alone is credited with saving 1,200 tons of fuel each year. The Emma Maersk was named for Maersk McKinney Moller's wife, Emma. Her maiden voyage started in September 2006 and took her from Denmark through the Suez Canal to Singapore, China, and back to Europe. One of her most famous voyages occurred in December 2006, when she briefly became the SS Santa because she carried Christmas goods from the UK to China.